Spring brings a lot of great things - birds chirping, flowers blooming, and webinars buzzing! We are particularly pleased to introduce two new webinar series that focus on Reporting and Floodlight. For some sessions background knowledge is recommend. Please note the prerequisites listed for each webinar, as this knowledge will help you get the most out of each session. When registering, please be sure to note the regional designations before clicking the link to enroll. This session covers the basics of Trafficking in the DFA6 UI. Users new to 3rd Party Ad-Serving and DFA6 are encouraged to attend. The bulk of the session focuses on Trafficking but touches briefly upon Floodlight and Reporting. Great for beginners and anyone that wants a refresher! Introducing our New Reporting Series! This session focuses on the new Reporting tool. Understand how to slice and dice data in the Summary tab (dashboard view), run reports in Report Builder. Prerequisite: Basic knowledge of DFA6 (available in DFA Fundamentals webinar or eLearning). This session explores the ‘Attribution’ tab in the new Reporting tool. Get a look at uses for Multi-Channel Funnels, Attribution, and Modeling. Prerequisite: Moderate experience with Report Builder or completion of the ‘Report Builder’ webinar session. Introducing Our New Floodlight Series! This session will provide the information you need to make sure you’re creating, testing, and fixing your Floodlight tags correctly. Prerequisite: Basic knowledge of Floodlight (available in DFA Fundamentals webinar or eLearning). This session will discuss how the use of Custom Variables and Macros can help you gather a wide variety of data that may be useful for your business. This course also covers the use of Macros to pass information from Floodlight to 3rd party pixels. This course will provide you with an overview of Floodlight tags: understand what they are, which types of tags are available and some implementation tips. Visit the DFA Help Center to enroll in any of the upcoming live training sessions or eLearning modules. Stay tuned for more topics and don’t forget to sign up for the DoubleClick Digest to get the latest scoop on news, research, events and product updates from DoubleClick. Opt-in here! Last week on March 11 and 12, our DoubleClick Search team spent two demo-packed days on the floor at the Search Marketing Expo - West, to connect with those of you who manage some of the largest search campaigns. We set up an interactive lounge featuring demos, videos, games and product experts -- allowing us to show you how we help you go faster, make smarter decisions, and get better results to solve the most complex and demanding digital marketing challenges. Today, we wanted to share some of the topics we covered and the insights we heard from attendees. To kick off the discussion, we’re sharing a DoubleClick Search overview video, which we debuted at SMX West -- with more details that follow. As a performance marketer, you know it’s ultimately all about results. Over the past few months, we’ve focused on enhancing our Performance Bidding Suite for automated bidding -- understanding that smart bidding technology is the engine that drives campaign performance. At SMX West, we demoed our intuitive bidding UI, which lets you easily express flexible goals that align with your business objectives, and highlighted how fresh data, smart algorithms, fast operations, regular software updates, and the right transparency and controls help you achieve those goals. We’ll chat with the team that built Cadillac’s interactive video ad, “The Standard of the World,” and discuss the benefits of incorporating interactive video into your digital advertising campaigns. We're all used to the idea that you watch a video from beginning to end without stopping; this concept of “linear and sequential” video hasn’t changed much since movies got started. But we also know that there are situations when you don’t want to wait until the end of a video to learn more about what you’ve just seen. Say you’re watching a snippet of a TV show, and they mention an actor you like; you might want to pause the video, open another browser tab, and look up the actor’s background or the movies he’s been in. Once you’re satisfied with the info, you go back to the video and keep watching. This is the concept behind interactive video ads, a type of ad format that is becoming a mainstay in the world of digital advertising. Rather than merely repurposing your TV commercials for smaller screens, take advantage of the inherent interactivity available on desktops, mobile phones and tablets, and allow people to dive deeper into your ads. With interactive in-stream ads, we can bring the best of the lean-back experience (watching TV in a full episode player) together with lean-forward active brand engagement. Interactive in-stream video ads allow you to add panels of content on top of your main video ad, presenting viewers with the option to learn more directly in the ad unit, rather than having to open that extra browser tab. From a business perspective, this not only gives you more space for messaging, it also means that you can buy a 15 second ad spot, yet obtain 30 or 40 seconds of user interaction for no extra cost. These new interactive video formats also open the door to more creativity and innovation. You now have the ability to layer on additional graphics, designs, and other creative executions on top of the original video asset to showcase the brand’s message. It’s like creating a pop-up book instead of a 2D picture book - suddenly you have many more surfaces to work with. The IAB recently announced their rising star formats for interactive video, a couple of which we contributed to, including “Timesync” and “Full-screen.” While the official formats are still being defined, we’ve built a demo to exemplify one of the new formats and why these ads are great for brands. This Friday, March 22, we’ll be hosting a hangout-on-air on our new DoubleClick Google+ page to deconstruct this demo, Cadillac’s “The Standard of the World” ad. We’ll chat with the team that built the ad and discuss the benefits of incorporating interactive video into your digital campaigns. 2) Visit our G+ page at 2:30pm ET/ 11:30am PT this Friday, 3/22. 3) Click the “Join Hangout” button to enter the hangout. We hope you'll be able to make it! 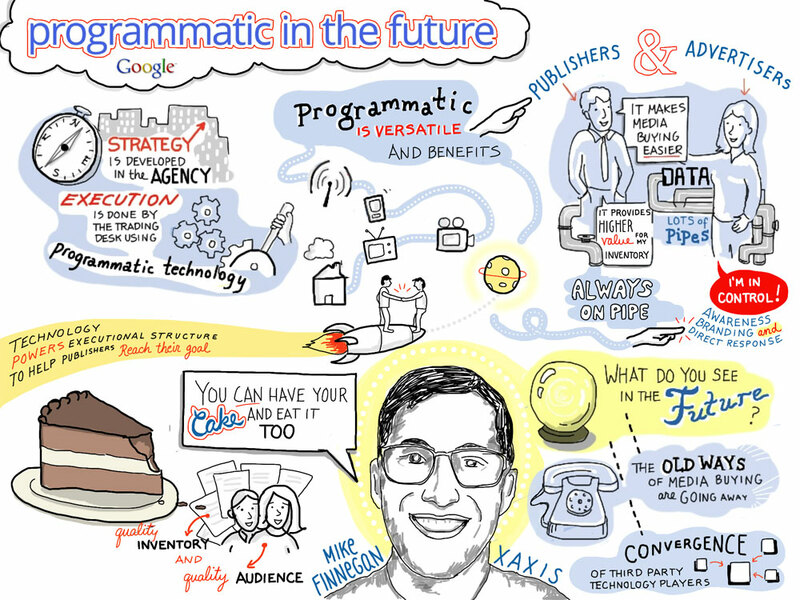 [Update] Programmatic in the future: Are programmatic channels safe for brands? Update: Due to unexpected circumstances, this hangout has been canceled on Thursday, March 7. Stay tuned for more information when it is rescheduled. In our next installment of "Programmatic in the future". Join us on Thursday, 3/7 at 1:30 ET/10:30 PT as Digiday's Editor-in-Chief Brian Morrissey, interviews Penry Price, President, Media6Degrees, and Nate Stricker, VP, Group Account Director for Digital at Initiative.